With less than two weeks to go before the 2016 DJ Awards at Pacha, Ibiza, the DJ Awards Radio Show on Pioneer DJ Radio invites another top class act to drop an exclusive mix. French duo Amino Edge & Dance, step up to deliver their high-energy sounds to the listeners of Pioneer DJ Radio for one night only. Hailing from Southern France, Amine Edge & DANCE have taken the dance world by storm with their ground-breaking sound and high energy shows. Mining the musical spectrum and taking inspiration from early House, Philly Funk, 80's Hip-House and everything in between, Amine Edge & DANCE bring their own cross-genre blend of Tech and House to clubs and festivals across the globe. Having enjoyed a meteoric rise, the CUFF label bosses have now cemented themselves as the leaders of their genre and the go-to guys for the best-dressed parties in town! Not content with just being superstar DJs, the duo are also skilled producers and can regularly be found riding high in the top charts. Their undeniable ear for a catchy hook and a knack for crafting moody, future-facing club edits is evident in their versions of Frank Ocean's 'Lost' and the Notorious B.I.G-sampling 'Going To Heaven With The Goodie-Goodies'. The annual DJ Awards are set to take place at Pacha Ibiza on October 3rd and will honour the best acts of the year in various categories such as Bass, Breakthrough, Deep House, Electronica, Electronic Live Performer, House, Newcomer, Tech House and Techno. 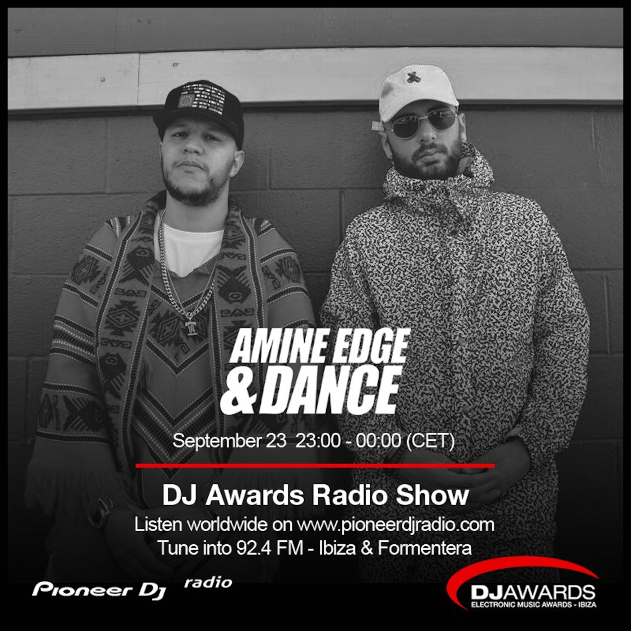 Catch DJ Awards Bass Artist Nominees Amine Edge & DANCE on the DJ Awards Radio Show on September 9th (Friday) at 23:00 (CET) via pioneerdjradio.com.